AAA Africanized Bee Removal Specialists, Inc fully licensed to perform bee control, wasp control and pest control service in Phoenix, Tucson and surrounding Arizona cities. Each certified bee removal specialist is individually licensed by the Office of Pest Management, Arizona Dept. of Agriculture, in addition to being a professionally trained AZ beekeeper in beekeeping, honeycomb removal, bee removal, African bee control, wasp removal and aggressive wasp and hornet control. We are beekeepers and real professional bee removal, honeycomb removal and wasp control and hornet control specialists. Since 1993, we are internationally known Arizona beekeeper experts in African bee removal, honey bee removal, honeycomb removal, Africanized killer bee control, wasp removal, wasp nest removal, aggressive wasp control and are beekeeping and bee removal specialists. We also provide emergency bee removal and wasp removal services, since the advent of Africanized honeybees (killer bees). We are not just a pest control company! What sets us apart is that our primary business is bee removal services. Your standard local pest control company will simply have bee removal services. Our trained Arizona beekeeping professionals are licensed to ensure that every job, from removing Africanized bees to removing damaging honeycomb from your home is done correctly and will not result in re-infestation. 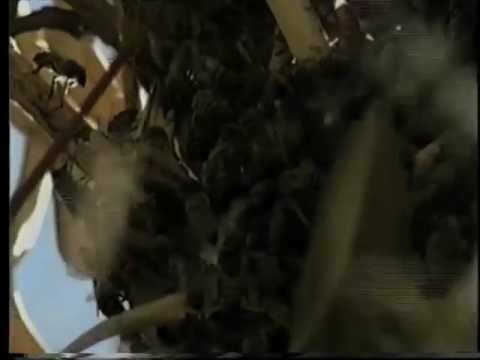 Prior to African killer bees being discovered in Tucson, AZ in 1993, we sent beekeepers from our staff to Mexico to study how the invasive species would affect our commercial bee hives. 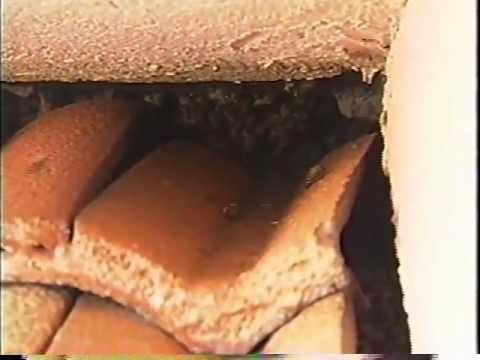 We began developing techniques to protect and secure our commercial bee hives. As a result, we are the oldest beekeeping company that specializes in bee removal, bee control and bee swarm removal in Arizona. We specialize in the following bee, wasp, honeycomb and nest removal services. Click on the service below to learn a little bit more about how we can help you! Bee removal is a highly specialized profession unlike general pest control. Removal of a bee colony or bee swarm or beehive requires a thorough understanding of honey bee behaviors and honey bee biology. African bees are much more aggressive and defensive than other bee species and have been the cause of many serious injuries and deaths to people, livestock and pets in Arizona. Just like bees, a wasp removal specialist must have an understanding of Arizona wasp behavior, wasp biology, and professional experience and know how to handle them safely. Honeycomb removal is an art developed by professional beekeepers and should only be undertaken by true professionals in the industry. We’ve provided a comprehensive guide to bee, wasp, honeycomb removal and the range of services therein. 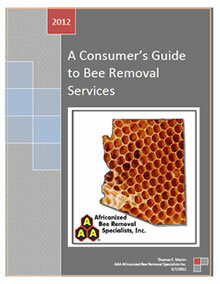 This is a guide that we produce specifically to the consumer so that they can better understand the process, range of options and benefit from our expertise in bee removal. Clicking on the image to the right will allow you to view and download this document in PDF format.